The legendary Czech rock album is back! Exactly 40 years have passed since the release of the groundbreaking record melding electric big beat and Josef Kainar’s poetry in a unique symbiosis. Combining immense energy, modern arrangements using wind instruments and, the rather basic recording equipment notwithstanding, a timeless sound, it is an exceptionally compact musical monolith for its time, even in international terms. The producer Hynek Žalčík helmed the album’s origination and its Supraphon release by getting together young musicians and a blues poet just before his death. Messrs Fořt, Khunt, Kubík, Kulhánek, Mišík and Šedivý transcended the standard rock vocabulary in the direction of more colourful pictures, phrases and communications. All this, as well as a series of splendid concerts, made Kuře v hodinkách (Chicken in the Watch) an absolute prog rock phenomenon. The current reedition offers the original album in its entirety plus the additional bonus songs Každou chvíli (Every Moment), Týden v elektrickém městě (A Week in the Electric Town) and Kuře v hodinkách (an alternative single version). The remastering from the original tapes has allowed for the maximum capturing on CD of that which was recorded in the past. The exquisite booklet, containing the complete lyrics, was created by Karel Haloun in the fashion of his own 1998 version yet supplemented and laid out in an elegant digipack. 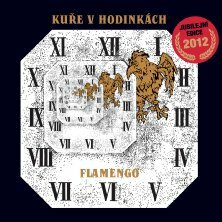 Kuře v hodinkách, 2012 model: brilliant timeless prog rock in a jubilee sound and packaging! The three bonus songs suit to the original album, the music as well as the recording quality. This CD reissue comes in a beautiful designed brown 6 pages digipak, which is packed in a slipcase showing the original front cover. The additional booklet contains all lyrics.